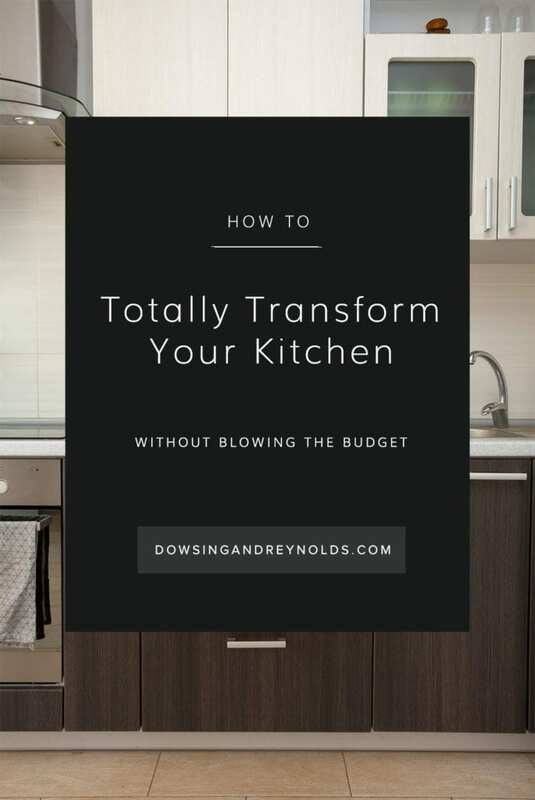 So how do you totally transform your kitchen without blowing the budget? Well, it may well be an overused cliché but there’s no getting away from the fact that kitchens are now very much the beating heart of our homes. Once just a room that was pretty much a female-only zone (I know, unbelievable to think that now), these days it’s a real hub. The place where it all happens… Cooking, eating, drinking, working, reading, homeworking and even occasional dancing on the table (don’t pretend this doesn’t happen!). It’s definitely my favourite room in our house; even after having an extension built to make the room bigger, we still huddle around the main kitchen area chatting and downing a good Yorkshire brew. New kitchens cost a lot of money. Fact. Even if your kitchen is small, or you go for cheaper fixtures and fittings, the costs have a sneaky way of spiralling way over your original budget. This absolutely doesn’t mean that your kitchen dreams are over though, hell no! There are so many other ways of totally re-vamping your kitchen without emptying the entire contents of your bank account. Ok, so we’re not talking about re-jigging the overall layout of the room as we’d quickly slip into the aforementioned budget-busting territory. But with lots of clever tips and tricks, you’d be surprised by just how much you can transform your kitchen into a space where you’d like to hang out A LOT more. We’ll start at the top of the room with lighting, and then work our way right down to the floor. There are lots of ideas here so pick and choose which ones work best for your kitchen and budget. We could talk for hours about lighting, it is our specialist subject after all. We’ll keep it simple here, but it may be worth you having a read of our Colour & Light and Getting it Right post which goes into more detail. If you only take one thing from it then let it be this: a dimmer switch will be your new best friend. So, without coming to inspect all your kitchens individually, I’ll take an educated guess that most of them would benefit from more lighting to make them a) a safer space to work in, and b) a more welcoming place both day and night. Our most popular lights for kitchens are the enamels, and for good reason too. 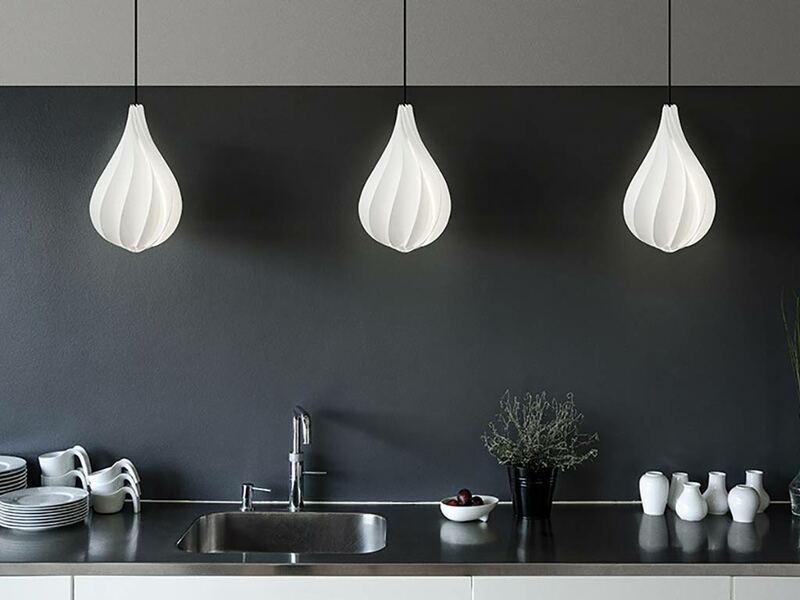 They’re great not only as a single pendant but in multiples over a kitchen island unit or and dining table too. The same goes for the cage pendants; incredibly stylish and they cast a great light. These are all wipeable too which is very handy. It’s also now possible to bring wall lights to a certain area of your kitchen without having to gouge a hole in your wall! This is thanks to cables that are so gorgeous that it’s perfectly acceptable to show them off. If you’ve got a standard socket nearby then our peg light is great for creating a general ambiance, or for zoning an area of your kitchen – the dining space for example. Ok, so not strictly a re-shuffle, more of a thorough overhaul. You could push the boat out and replace the doors of your cabinets – there are some fantastic companies out there that sell bespoke kitchen doors. The downside? Despite using your existing carcasses, it can still be pretty expensive. There is a much cheaper alternative though, and that’s to paint your existing doors. Yes, it’s fairly time-consuming – hop over to our Paint Like a Pro blog and just see how many times Lyz says the word ‘prep’! But it’s so worth the effort. 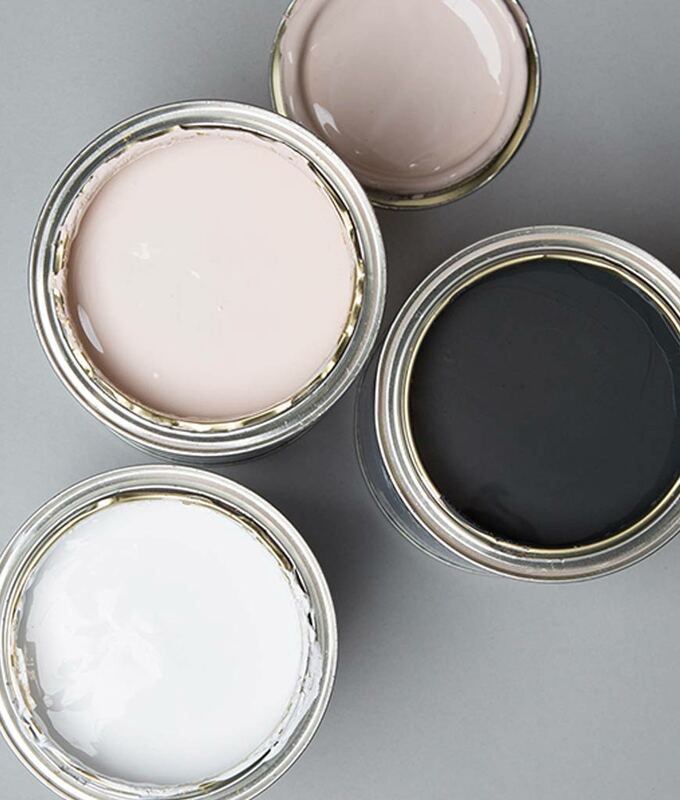 Our gorgeous range of paints come in different finishes so depending on what surface you’re painting, choose the nearly matt or wood paint. 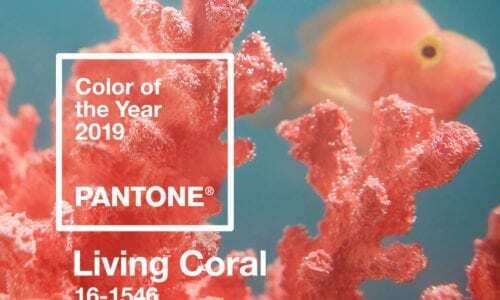 And don’t think for one minute that you have to choose just one paint colour for your cabinets; mix it up a bit with one colour on the lower cabinets and a complementing colour on the upper cabinets. I really love the combo of our All The Lights Off and Get Plastered paints. But if painting your cabinets isn’t an option, then of course you could paint your walls or woodwork. There’s nothing like a newly painted room to give it some oomph! Wallpaper’s also a great option for a kitchen wall. 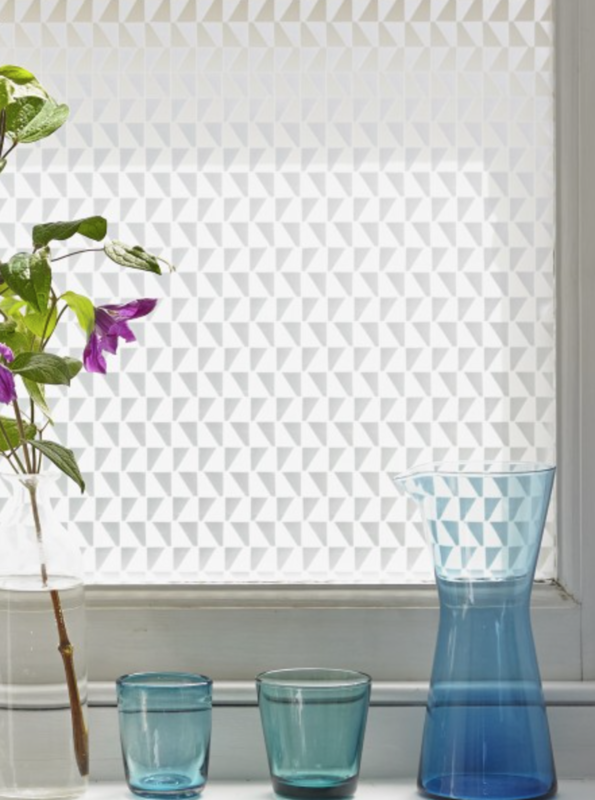 We often associate wallpaper with living rooms, hallways and bedrooms, but with so many washable wallpapers around now, there’s absolutely nothing to stop you using it in your kitchen. The crowning glory of any cupboard door or drawer has got to be the handles. They have the magical ability of being able to make an inexpensive kitchen look incredibly high end, just like that. 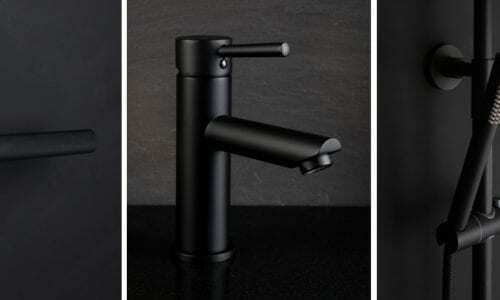 Now I know I’m biased, but we really do have THE best selection of kitchen handles. 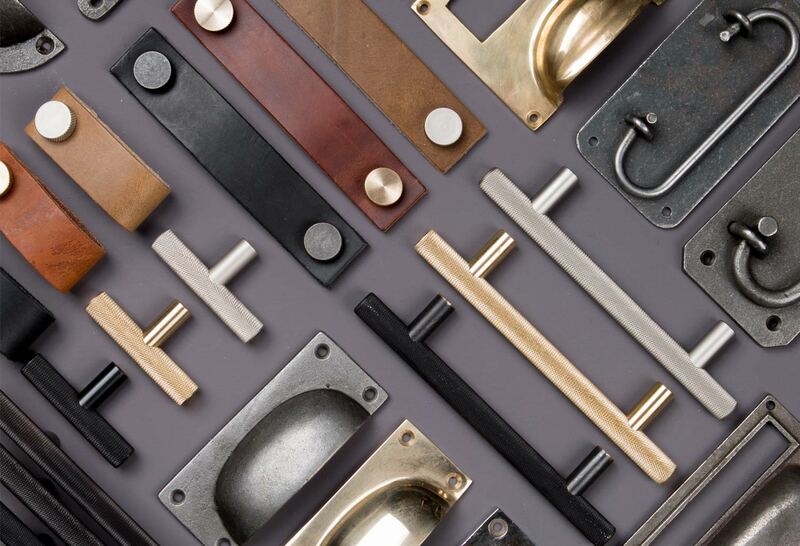 There are so many gorgeous ones to choose from, so to help you decide Keren has written a handy blog Kitchen Handles: A guide to making the perfect choice. Two of my favourite paint colour/hardware combos are our Spruce Things Up paint with Gold Skyscraper handles and our All the Lights Off paint with the Thor leather handles. Absolutely stunning. Moving on to an all-too-often overlooked part of any renovation project: switches, dimmers and sockets. 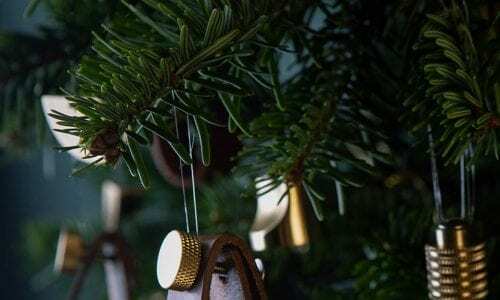 We’ve been trumpeting the merits of desinger hardware for some time now and have well and truly earned the title of ‘expert’ in this field too. When it comes to adding some seriously luxe finishing touches to a room then this is an incredibly easy win. 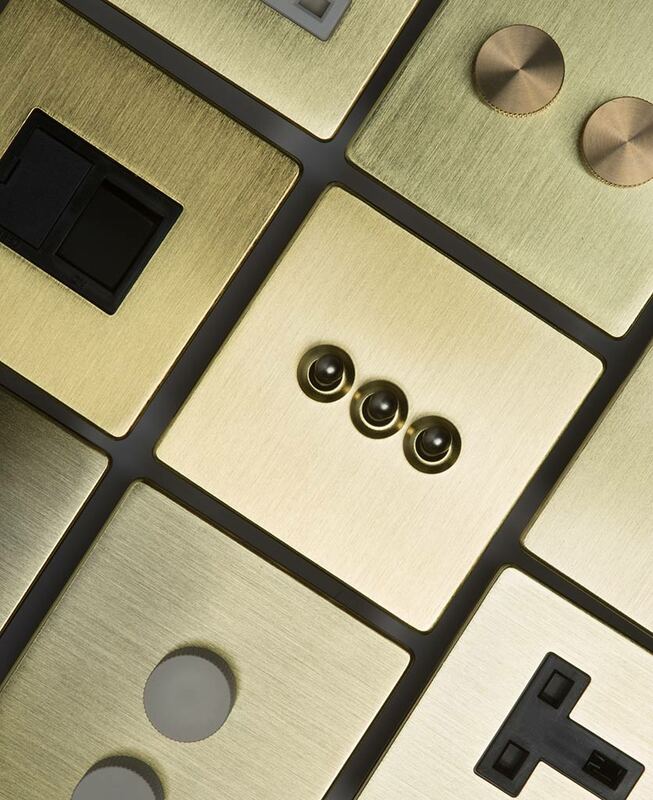 Not only does our range of switches, dimmers and sockets come in six different finishes, it even includes cooker switches and USB ports, so every little detail is covered. “Look, spaghetti arms. This is my dance space. This is your dance space. I don’t go into yours, you don’t go into mine”. A tenuous link you might think but apply this logic to worktop space, and the random clutter that routinely gathers there and you’ll start to see where I’m going. Not having enough room to prepare food is a real pain and takes away all the enjoyment from cooking. One cheap and easy tip is to buy a chopping board that’s big enough to cover your sink. Hey presto you’ve got some instant, extra prep space. If you’ve got the room though, and especially if you’ve only got floor cabinets in your kitchen, a great way to free-up some worktop space is to put up a shelf (or two). 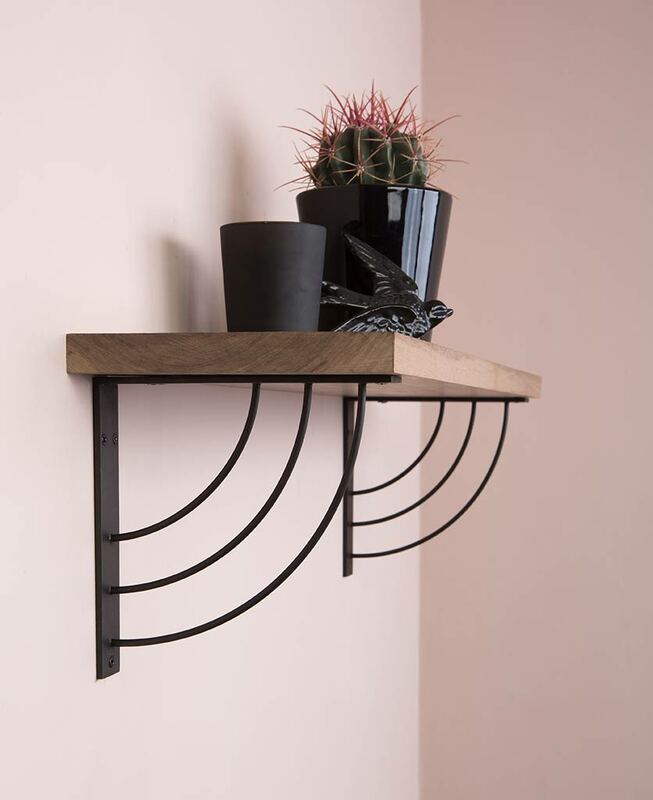 If you want to design your own then our beautiful shelf brackets are just the job to help you create a bespoke shelf. As well as being an alternative space for the more hum-drum items that would usually reside on your worktops, shelves are the ideal place for showing off your creative side. Style them up with plants, artwork or a mirror, and if you’ve got a socket nearby then this is a great place for some ambient lighting. One of our cage table lights would be perfect here. But if it’s a ready-made shelf you’re after then look no further than our stunning range of metal shelves. They come in four colours and two sizes, so there’s got to be one that’s right for you! As well as serving a practical purpose, splashbacks are a superb way of bringing some texture, colour and pattern into your kitchen. Think of them as a sturdier version of a statement wallpaper. 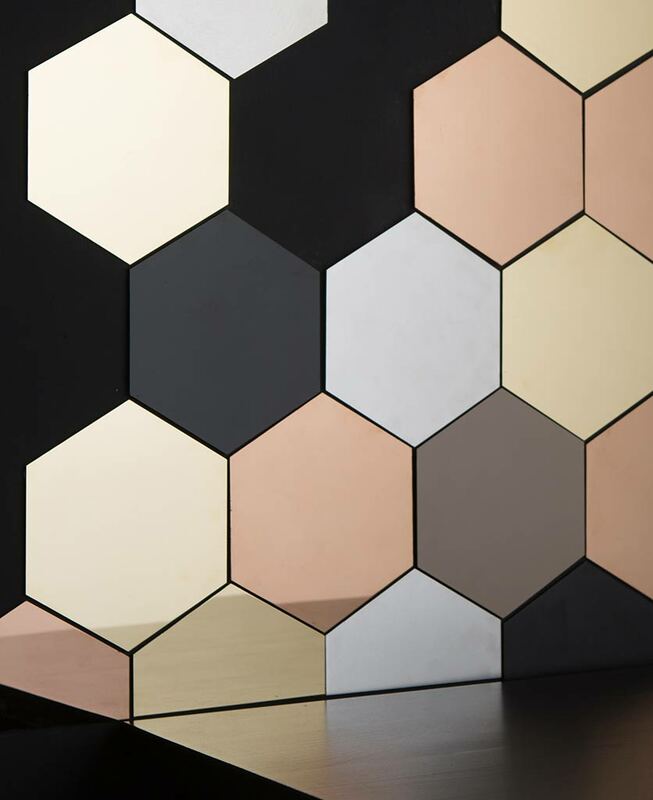 Our hex tiles are brilliant for splashbacks and would certainly elicit some oohs and ahhs from your friends! These clever tiles come in pre-cut halves too so there’s no faffing around when it comes to the edges. There are five different colours to choose from, some shiny and some matt. The shiny ones are fantastic for bouncing light around a room, so if your kitchen is a bit on the dark side then these are a great option. Just as shoes can make or break an outfit, floors can make or break a room. If your kitchen floor leaves a little bit to be desired then there are loads of amazing vinyl floor tiles which can be laid over your existing floor whether it’s laminate, wooden floorboards or ceramic tiles. Just make sure you fill in any gaps between your current floor tiles or boards for a smooth finish. Here’s a round-up of all the other bits and bobs that turn a bog-standard kitchen into a great kitchen. Some of these may seem small-fry, but trust me, they will make a difference. First off, small appliances. After you’ve replaced all your sockets with our gorgeous ones, don’t then go and plug in a crumby old appliance. Even supermarkets sell high-end looking toasters and kettles these days so there really is no excuse! Secondly, on to the soft stuff – cushions, seat covers and even tea towels (why oh why do we carry on using the same old greying, stinking crispy tea towels year after year?). They’re so cheap to buy so go and treat yourself to some jazzy new ones! When it comes to the fabric of your soft stuff, just avoid being overly matchy-matchy. Don’t be afraid of complementing and even contrasting colours, fabrics and textures.